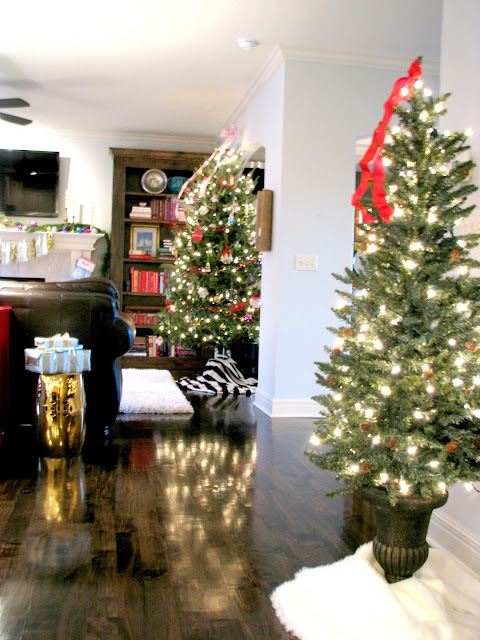 Welcome to our Christmas Home Tour! If you are new here, thank you for stopping by! 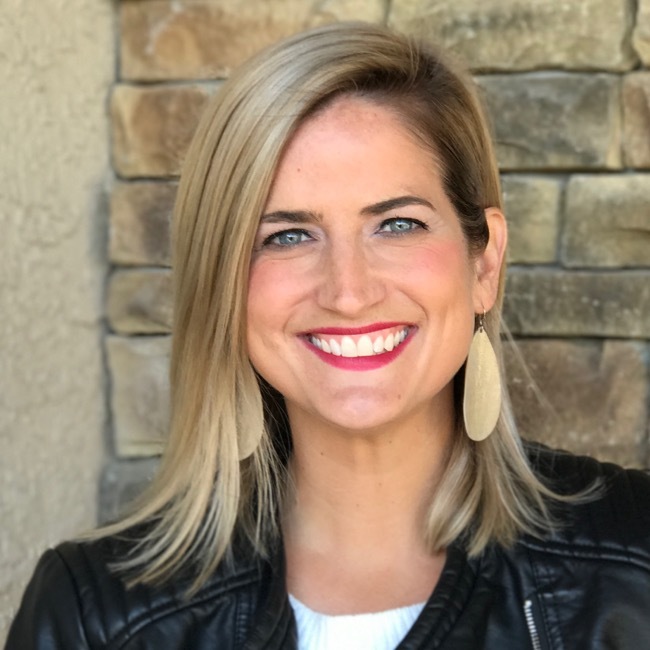 I am excited to be a part of a tour with so many wonderful bloggers. 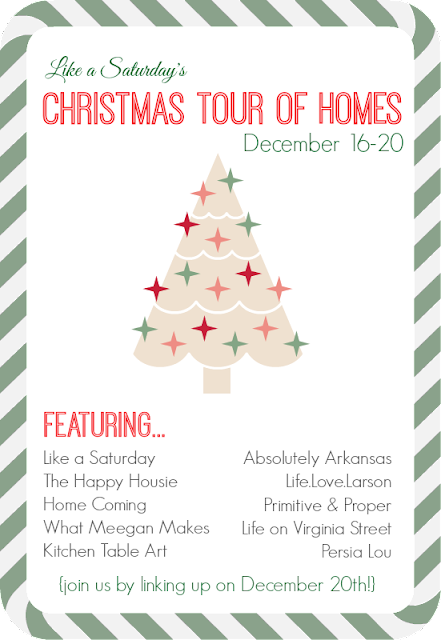 Make sure you check out all of the stops along the tour, and link up your own holiday home on Friday at Like A Saturday. If you are stopping by from Absolutely Arkansas (stop #6 on the tour), welcome! This year, I finally decided to donate a lot of our Christmas "stuff" and decorated only with what I really felt represented our style as a family. 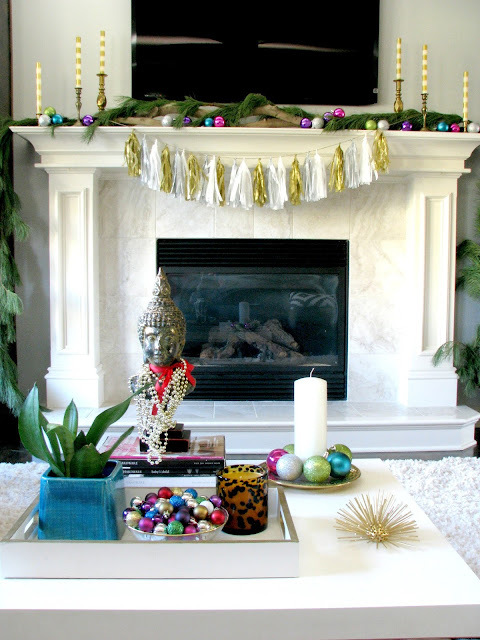 The most important thing to me is having a home that feels cozy this time of year. Gone are the days where I feel like I have to put out every little thing that was ever gifted to me or handed down! 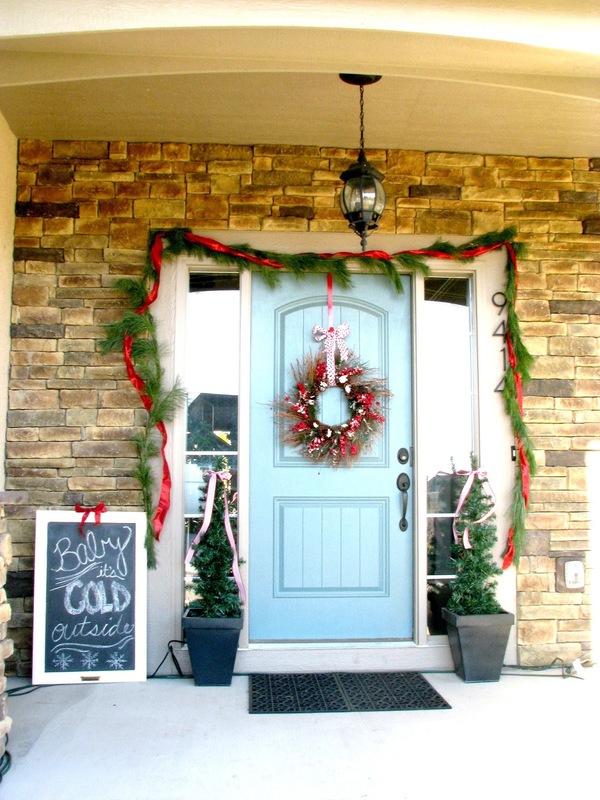 I usually go pretty traditional on the porch, using fresh garland and a little ribbon to dress up the door. 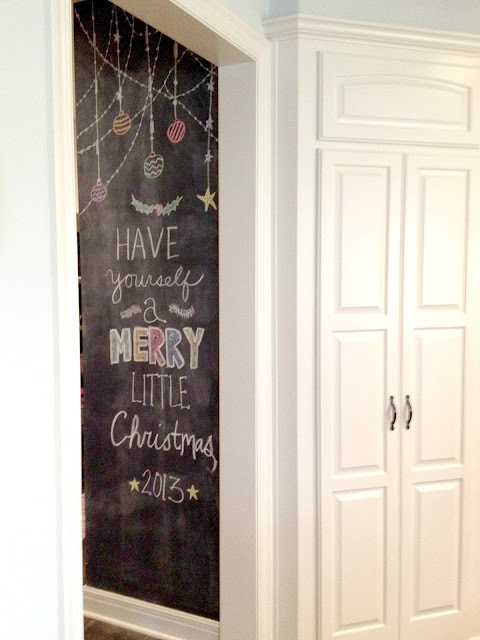 I love bringing this chalkboard outside for all holidays/parties. The two small pre-lit trees were Goodwill finds from a few weeks ago! 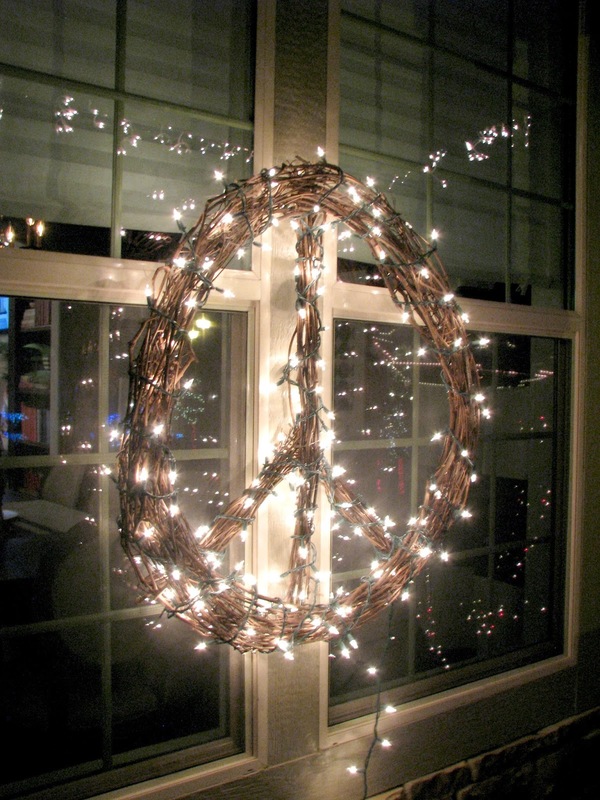 I also decided to move my CB2 Knock Off Peace Wreath outdoors, hanging it in front of two windows on the porch. It's huge, and I love how it looks from the street. I only decorated the first floor with small touches and kept things pretty simple this year. There really is no theme, just a lot of color, which I am clearly not afraid of! The red dresser is always in the house, so it looks very festive this time of year! We always get a real tree. I love them. 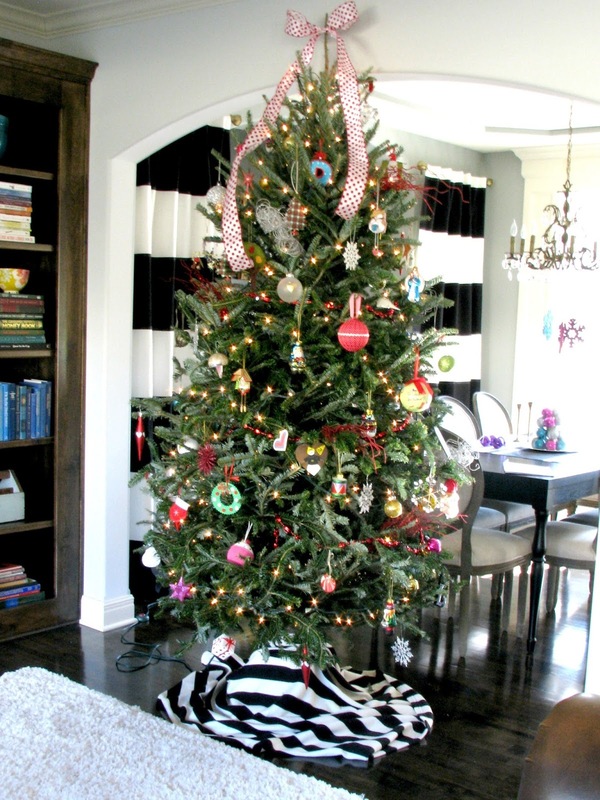 Every year, we do white lights, and this year, I added a striped blanket as our tree skirt. I decided a simple ribbon would serve as the tree topper this year. I actually scored another thrift store tree this year, and set it up between the kitchen and great room. I had some faux fur laying around for another project, and decided to use it as the tree skirt. Next year this will be the kid's tree, and the main tree might have to be changed up a bit! Our mantel consists of more fresh garland, gold candlesticks, a DIY Metallic Tassel Garland, and some bright colored/glittered ornaments. 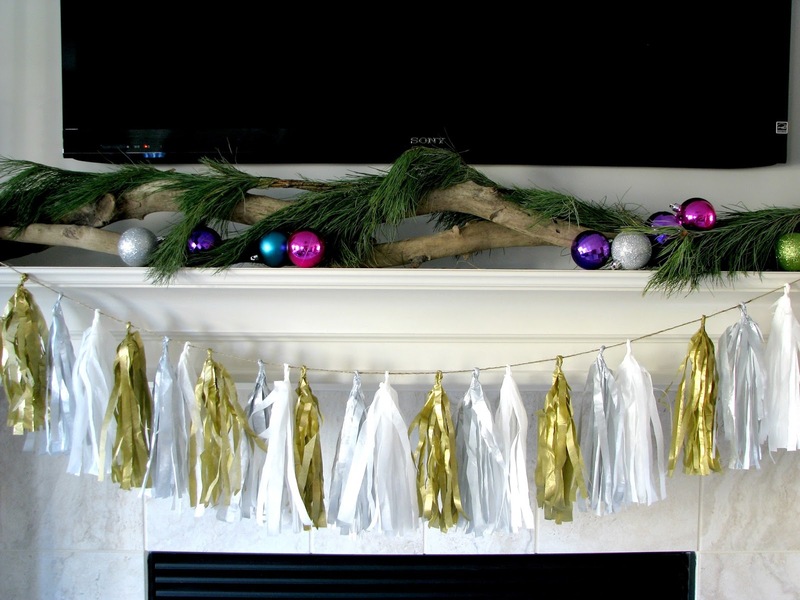 I keep the driftwood on the mantel year round. 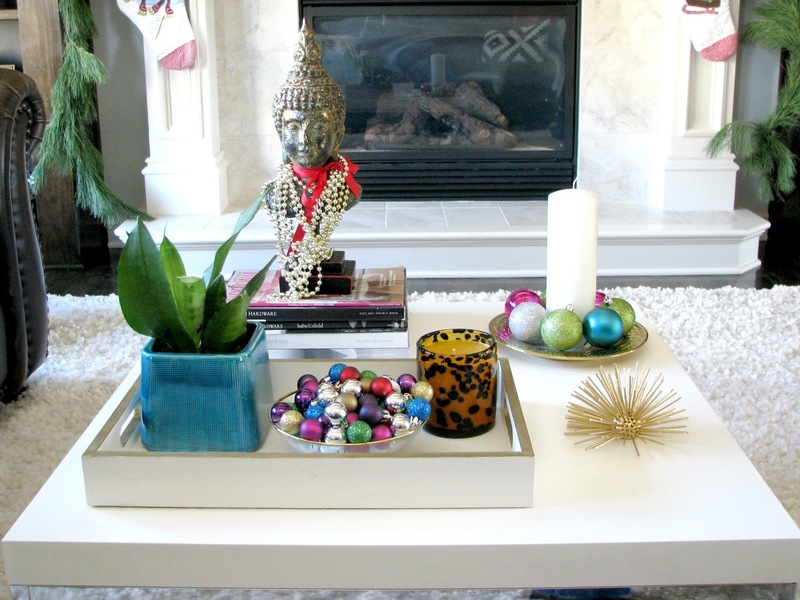 I added a few touches to the coffee table to make it festive too! I am a sucker for a bust. A strand of gold beads and a little red bow dress her up for the holidays! I only added a few touches in the kitchen. 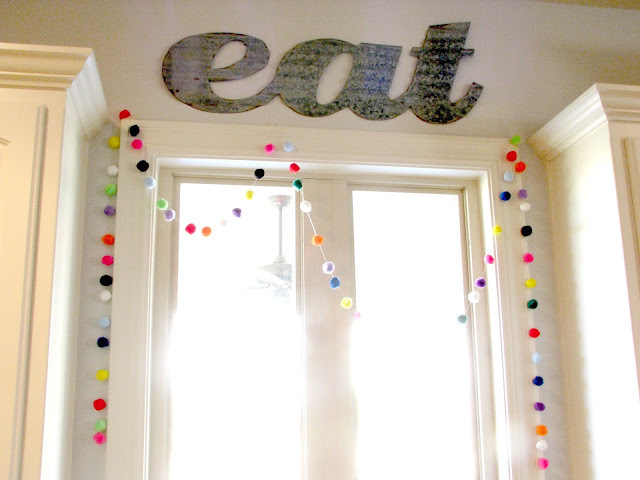 This DIY Pom Garland I made last year found its way back to the kitchen window again this year. I love the whimsy of this simple garland, and it brings great color to our white kitchen! 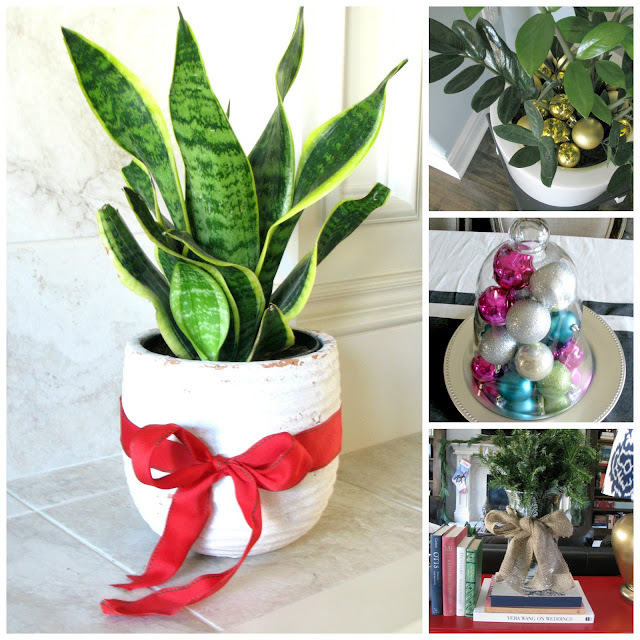 I find that adding ribbons and bows and bulbs to everyday items is such an easy way to bring in the holidays without having to do much work! I found an image on Pinterest that I tried to duplicate on our large chalkboard wall between the mudroom and the kitchen. Don't judge my artwork! I like to be creative, but never claimed to be an artist! 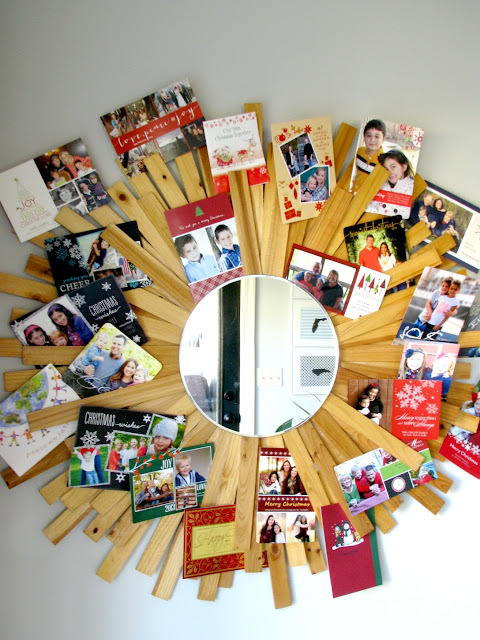 Lastly, I have been hanging our Christmas cards on our DIY Sunburst Mirror this year. 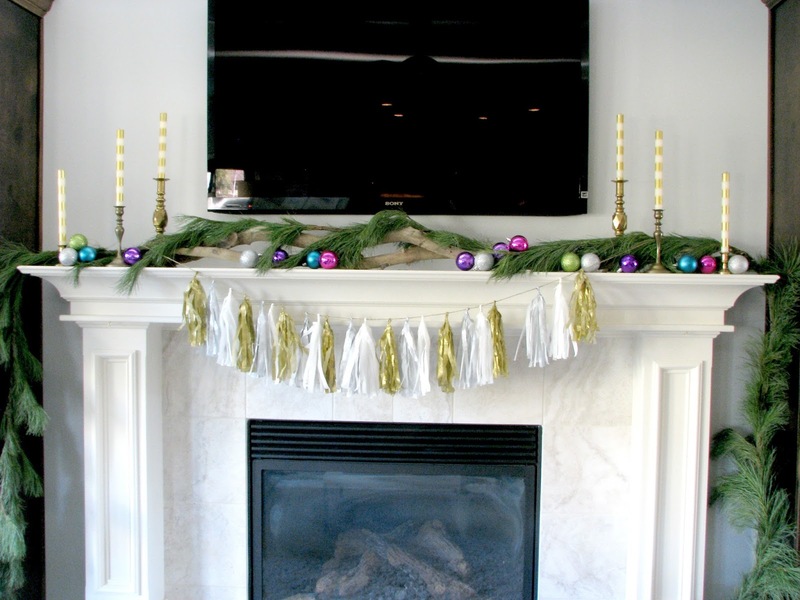 It makes for a decoration in and of itself, with no effort! I might be leaving these up after the holidays! 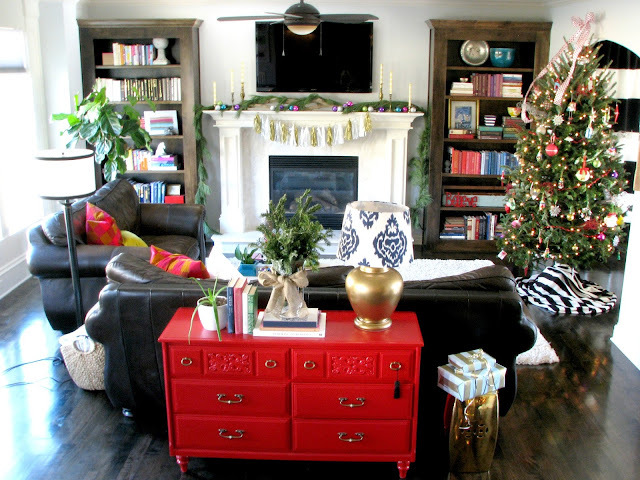 I hope you enjoyed a peek into our Christmas Home! Thank you for stopping by! Make your way on over and see her lovely home! Thanks for letting me participate Rachel! I spy a "look for less" peace wreath! :) This looks gorgeous, Andrea! Thank you for sharing. I am ALL KINDS of obsessed with your entry! I know - getting to use my L4L challenge in the home tour! It worked out nice!! Thanks for stopping by!! Your home is gorgeous! 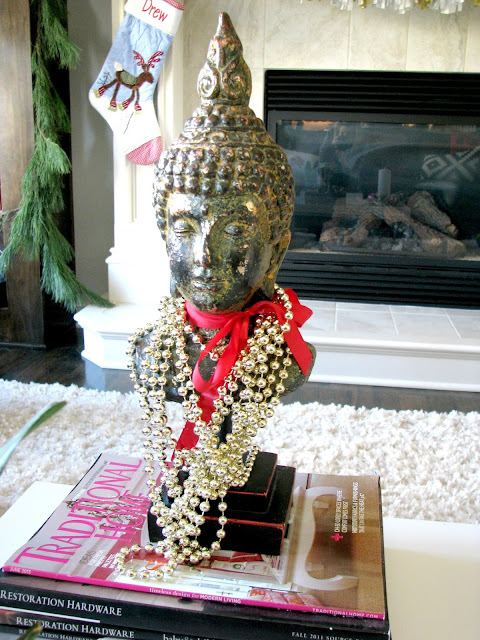 I love your tree skirts and the beads and ribbon on the bust. And your porch is perfect. your home looks so festive! i LOOOVE that tassel garland!